How does Microsoft's new media hub cope with broadcast TV? Media centre PCs are an increasingly popular option, thanks to the low cost of storage, memory and processors powerful enough to decode and record multiple high-definition TV channels. If you've got an HD flat screen it makes sense to connect a PC with a couple of digital TV tuner cards - they can be easily upgraded for new formats like the forthcoming DVB-T2 for Freeview HD. 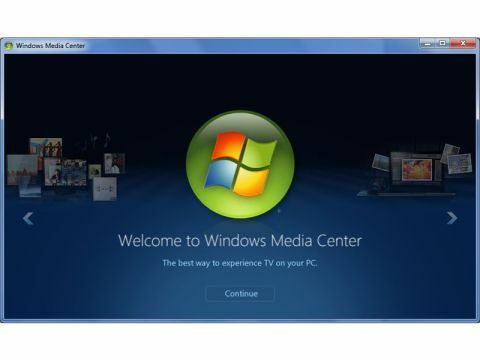 Despite powerful media centre software like Myth TV being free, Microsoft's Windows Media Center is always going to be popular because it's bundled with so many new PCs. A new version of Windows is out in October, so we downloaded the evaluation version of Windows 7 Ultimate Edition to test the latest Media Center. Previous versions have significantly lacked DVB support, although Vista added DVB-T (but not DVB-S). Fortunately, the Windows 7 Media Center acknowledges even DVB-S2 and supports interactive Freeview and Freesat – although it won't tune ITV HD. When Media Center is first fired up from the Windows 7 desktop it launches a setup wizard for your display, speaker configuration, recording storage, media libraries and TV tuners. Speaker configurations go up to Dolby Digital 5.1, with our home cinema amplifier picking up Dolby Pro-Logic matrix encoding over a stereo connection from BBC HD, as well as the full digital audio. You can choose where to record TV and how much space to allow for recordings – 10 per cent is automatically set aside for a live TV cache. Media libraries can include networked hard discs or other PCs. TV setup begins with your country and post code so that it can set up local Freeview channels, then examines your system for tuners and downloads the appropriate Freeview mux frequencies. It automatically detected the two Pinnacle tuner cards in our test PC, even noting that the satellite card only had one tuner connected. We went for a standard UK setup, mixing terrestrial with satellite from Astra 2/Eurobird, but there's a choice of 60 worldwide satellites. Multi-satellite viewers can stop here, however, because there's no support for DiSEqC switches, let alone motors. Our scan of both Freeview and satellite was quick at 6mins and 28secs, but that obviously depends on the system being used. You can return to setup to scan for extra channels, either over your full range of tuners, the whole satellite or a single transponder, with selectable FEC. Finally, edit the master channel list for your TV guide. If you're mixing Freeview and satellite as we did, there will be some confusion because terrestrial channels are numbered by Freeview's logical channel numbering from 1 upwards, while satellite channels start at 101; but Freeview places radio channels in the 700s and interactive streams in the 300s, and you can't change channel numbers. Satellite channels that Media Center doesn't recognise are numbered from 1000 up. It will download programme information for your selected channels into the 14-day programme guide. Media Center is controlled from a scrolling menu bar that includes music, pictures and videos, movies and TV. There's also Extras – a collection of games and on-demand entertainment channels that are disappointing so far. A Tasks option contains settings, DVD/CD burning, sync to mobile devices and shut down. TV breaks down into Recordings, Live TV, TV Guide and Search. The TV Guide is where you can access your favourite channel lists – there's no limit on how many you can create – or use the ones Media Center creates automatically, including movies, HDTV, sports, news, kids' and most viewed. The Media Center categories are dynamic programme lists, including movies or HD from any channel. Media Center can colour code different programme types. But the EPG data isn't perfect; Channel 4 is flagged as an HD channel even though Channel 4 HD is currently only available to Sky HD subscribers. The movies tab contains both movies on your computer and a list of all movies on TV, shown by genre with downloaded DVD covers – it's surprising how many there are. Selecting a programme gives you a wealth of information and allows you to set up a recording. Each recording can have its own deletion options based on either time or disc space, or deleting as soon as you've watched it. You can also set a start/finish buffer, with a default of three minutes. Recordings can be managed through the Recordings option. The playback controls are a standard PVR set, with a one-touch record buttons. The current channel is always visible, either as a menu background or in a thumbnail, and one click will return it to full screen. Standard-definition playback is smooth and watchable even at full screen resolution – in fact, Freeview looked better than through our TV's own tuner. Live HD was occasionally jerky – be careful of background processes like virus scans. Recorded HD played back smoothly and, in addition to MPEG-2 and MPEG-4 AVC, Media Center supports most of the common formats, with MKV via the free Haali Media Splitter codecs. Freeview and Freesat interactive applications are both supported and run as fast as we've ever seen them.